A speculative debut collection, focusing on young women in Nigeria, which explores the ties that bind parents and children, husbands and wives, lovers and friends to one another and to the places they call home. A witty, oblique and mischievous storyteller, Arimah can compress a family history into a few pages and invent utopian parables, magical tales and nightmare scenarios while moving deftly between comic distancing and insightful psychological realism ... As in most collections, a few entries are less successful, but throughout Arimah demonstrates a deft wit and an ability to surprise herself — and her readers — with the depth and delicacy of her feelings ... Arimah’s magic realism owes something to Ben Okri’s use of spirit beliefs, while her science fiction parables, with their ecological and feminist concerns, recall those of Margaret Atwood. But it would be wrong not to hail Arimah’s exhilarating originality: She is conducting adventures in narrative on her own terms, keeping her streak of light, that bright ember, burning fiercely, undimmed. ...[a] remarkable debut collection ... Of all of Arimah's considerable skills, this might be her greatest: She crafts stories that reward rereading, not because they're unclear or confusing, but because it's so tempting to revisit each exquisite sentence, each uniquely beautiful description ... Arimah's collection somehow manages to be both cohesive and varied at the same time. None of the stories resemble one another, exactly, but they manage to form a book united not only by theme and by setting (the stories mostly take place in Nigeria and the U.S.), but by Arimah's electrifying, defiantly original writing. It's a truly wonderful debut by a young author who seems certain to have a very bright literary future ahead of her. ...[an] electrifying debut ... These are designed to leave marks. With its fluid blend of dark humor, sorrow, and excursions into magic realism, some of Arimah’s stories feel like a jazzy cross between Octavia Butler and Shirley Jackson. Yet there is nothing derivative here ... In this sharp, meticulous collection, Arimah is more concerned with the ways, for better or worse, people try to navigate love, the meaning of home, and the hard corners of their lives. 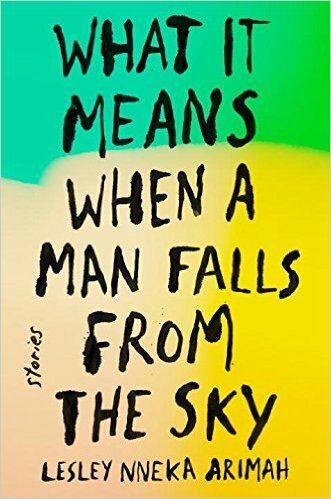 What did you think of What It Means When a Man Falls From the Sky?